Dream About Tea was born as a vision to provide a unique cup of tea fitting for friends’ gatherings, business appointments, or an individual who would like to meditate in a relaxing atmosphere filled with the oriental decor, music and tea ceremonies. Our philosophy is to spread tea love through our tea-brewing expertise and you, our valuable customers. 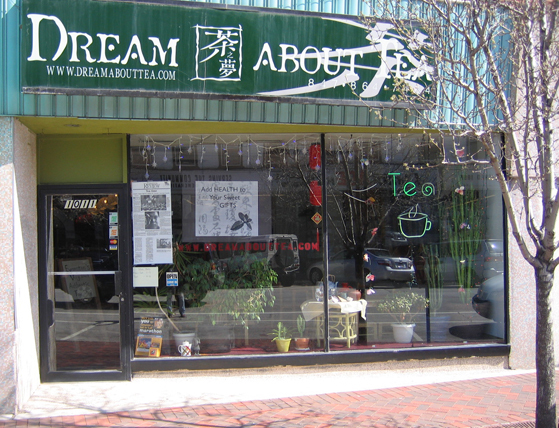 Dream About Tea is a single-unit medium-sized teahouse located in Evanston downtown, a campus city of Northwestern University. We sell a full line of traditional, specialty blend and herbal teas together with a vast variety of fine tea pots, cups and gifts. In the teahouse, our customers will share one thing alike, which is a feeling of being in the ambience of peace and tranquility far from the madding crowd and turmoil of the big city to enjoy healthy tea drinks, a different cultural experience, and teas of mind that you will never forget. Since we were little, we have always had this dream: There is a peaceful and hospitable place where people come and meet to escape from the turmoil of the world. At this place, tea is one of the things we share in common. We drink tea, talk about tea and even dream about tea. Growing up in the hometown of Dragon Well, I am an extremely passionate lover of tea. I love the wonderful aroma and taste of Green Tea, Wulong Tea, Pu-erh Tea, etc. I also love the health benefits and the serene spiritual experience when I brew and drink a cup of good tea. Through studying tea, I learned about the human body, diet, geography, history, cultures, aesthetics, etc. I am so grateful for tea, the unique gift from Mother Nature. To us, tea is more than just a drink, it is a way of life. We know tea and we share and care!